Virgin group and FRiENDi group announce strategic partnership deal to merge their regional assets and accelerate pan-regional expansion. Dubai, Johannesburg, London, 4 June2012: Virgin Group and FRiENDi GROUP today announced the signing of a strategic partnership agreement for the Middle East and Africa. Virgin, a leading international investor and one of the world’s most recognized and respected brands, is the majority shareholder in Virgin Mobile South Africa. FRiENDi GROUP is the leading Mobile Virtual Network Operator (MVNO) group in the Middle East. Subject to local authority clearances, the two groups will merge their regional telecom operations to create a combined entity to be called “Virgin Mobile Middle East & Africa” (VMMEA), which will develop and operate mobile telecommunications businesses across the region. The combined group will manage the current operations of Virgin Mobile in South Africa and FRiENDi GROUP in Oman, Jordan and Saudi Arabia, creating a sizeable regional mobile telecom player with more than 1 million customers. Virgin and FRiENDi GROUP have complementary brands across their respective demographic targets and both are focusing on providing great customer service and value for money. In addition the new group has ambitious plans to further strengthen its regional leadership position by launching in more markets across the Middle East and Africa, and is targeting a regional customer base of over 5 million subscribers by 2015 across both the Virgin Mobile and FRiENDi mobile brands. Sir Richard Branson, Founder and President of Virgin, commented “We are delighted to have agreed this strategic partnership with FRiENDi GROUP to create Virgin Mobile Middle East & Africa, and together we will create the undisputed regional leader in the MVNO space. Virgin and FRiENDi GROUP bring complementary skills and assets to the new venture and I have great confidence in its future success”. Mikkel Vinter, CEO and Founder of FRiENDi GROUP, commented “The Virgin Mobile brand is one of the most successful and revered MVNO brands globally, and the Virgin Group has an excellent track record of operating successful MVNO businesses in other parts of the world, so I am excited about working closely with Virgin Group on rolling out new MVNO operations across Africa and the Middle East”. 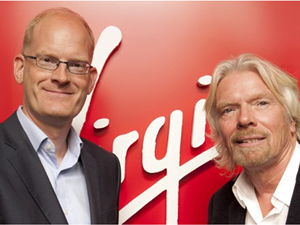 Upon completion of the deal being announced today, Virgin Group will become the largest individual shareholder of the combined group holding a significant minority stake. VMMEA will be led by FRiENDi GROUP CEO & Founder Mikkel Vinter, and will be headquartered in Dubai, UAE.